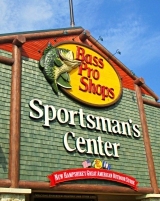 Hooksett, NH | Bass Pro Shops 2 Commerce Dr. Rob is the husband of our very own Promotions/Event Coordinator Madisson Rae! Congratulations on an awesome bird! Come on down this weekend to get some great tips on selecting the right turkey call and the right decoys from our very own Hunting Pro Staff Joe Judd! Prove to us you are the next great angler! Register on-line at basspro.com/thenextgreatangler and then come to our store this Tuesday for the live audition. Spring is right around the corner! Join us for two full weekends of seminars, vendors, pros and reps from some of the best companies out there February 6-15! Check out our BPS Hooksett Facebook page for more details. Happy New Year everyone! What is your outdoor resolution? Join the Bass Pro family for the kick-off of our Santa's Wonderland event! The event includes many opportunities for families to come enjoy the beginning of the holiday season with activities and giveaways. This Saturday, November 15th, at 5 pm! Our Outdoor Rewards Night will be this Friday from 6 pm to 9 pm. Stop by BPS Hooksett, NH for fun, freebies, and great giveaways. We hope to see you there! Happy Monday...and National Coffee Day! Hunting is not the only thing you can do this time of year, don't forget about fishing! We are having free striper fishing seminars tonight and tomorrow at Bass Pro Shops Hooksett, NH right from our local pros! Don't miss great giveaways, fishing tips and more. First workshop starts tonight at 7 pm. Tomorrow workshops run from 1 pm to 3:30 pm. Today kicks off our Local Pros Hunting Seminars weekend. Join us at 7pm this Friday for our first seminar: "So You Think You Know How To Bow Hunt?" Seminars will also be on Saturday and Sunday. Attend a seminar and receive a mug/survival whistle! Who doesn't love a freebie? This Sunday we have our Hunting University workshops. Learn from national pros that are experts in their field! Need something to do today? Don't Miss our ANNUAL TENT EVENT! Low Prices on Clearance Items! 20%-50% OFF select items! July 19-27! Come on down!